Land use strategies, supported by regulations and codes, have long been an accepted element of sensible planning efforts in community development and commuter transportation. The parallel arena of industrial development and freight transportation presents a valuable opportunity to apply a new set of land use planning parameters that maximize commercial productivity while minimizing use of land. Ultimately, it is also land use planning that will reorient the system toward the least impact on air and water. Currently, freight transportation land use is not consciously planned or regulated by public sector planning institutions. Ports, rail lines, roadways, waterways, and transportation facilities need to be planned with surrounding land use in mind. As important is the need to preserve land surrounding these freight infrastructure elements for freight production and distribution that maximizes the utility of these corridors and facilities. For many years, individuals responsible for the legislation and implementation of industrial and community planning have had a limited educational and professional exposure to freight transportation. Fortunately, these public-sector planners are already passionate about the environment, land use, and community planning. By reframing freight transportation as essentially a land use issue we bridge this gap. 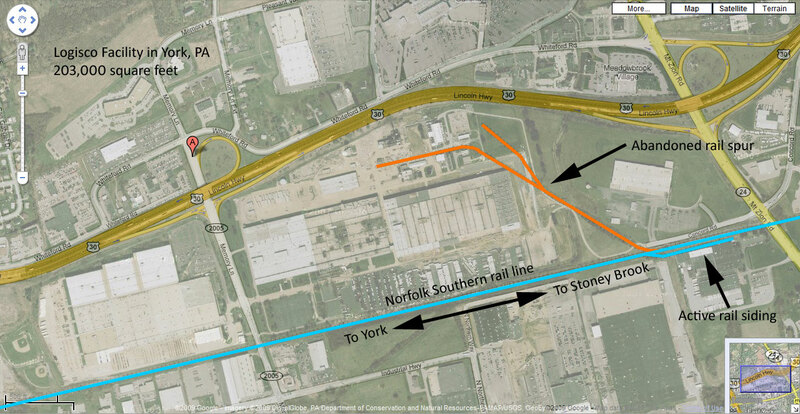 OnTrackNorthAmerica’s strategy preserves land along rail right-of-ways for rail-related activity and most efficiently locates commercial, logistics, and transportation facilities within the road, marine, air and rail systems. “The fact that it requires a convoy of trucks up to 27 miles long to move the same amount of freight as a one mile train demonstrates the need for developing a balanced, efficient system that includes thoughtful land use planning,” Sussman says. One disturbing trend in Pennsylvania and across the continent is the prevalence of large, truck-only warehouses and distribution centers built in or near small towns. Industrial and commercial development is being increasingly built without direct rail service, to the immediate detriment of the local community and at great cost to the public. Southern central and north-east Pennsylvania have been especially popular among warehousing and distribution developers; meanwhile, railroads that serve these regions can handle additional traffic. As a case study, OTA presents the 200,000 square foot Logisco facility in York, PA (see maps). This facility is bordered on the North by US-30, and on the south by the Norfolk Southern Railway’s Stony Brook branch, which stub-ends some two or three miles to the east, and connects with the Genesee & Wyoming’s York Railway to the west, as well as the rest of the Norfolk Southern network via Harrisburg to the North. This is an example of development that had previously been served by a rail spur, now abandoned and paved over, leaving truck-only access to the facility. The implication for a small city as rail-rich as York is heavy truck traffic on local downtown and residential roads, while rail service withers. This is surely an inefficient use of land. Any plan to bring this system back into balance should include a fresh articulation of a freight transportation land use strategy. In 2009, OTNA built significant support for OnTrackPennsylvania throughout the state legislature, governor’s office, and relevant non-governmental organizations and associations, including the legislature’s transportation committee chairmen and Governor Rendell’s policy team. OnTrackNorthAmerica is building its Freight Transportation Land Use Initiative on the valuable experience gained in this earlier effort.